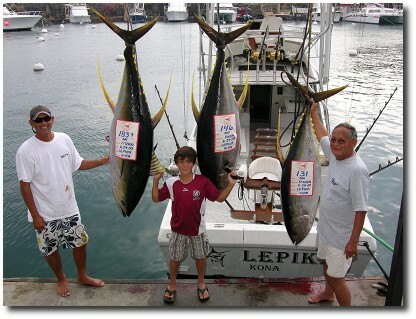 Kona is the Blue Marlin Capital of the World and known for its deep water just minutes outside the harbor. I’ve caught countless marlin within a stone’s throw of the green buoy on more than one occasion. Although the fishing can be great right out front, better fishing can often be found farther down the coast away from the pressure of other sport and charter boats. If your budget allows, I would highly recommend a full day. It greatly increases your chances of hooking into a true “fish of a lifetime”. Overnighter charters are for the more adventurous angler. 2 days of back to back fishing gives us time to find the fish and fish them hard for consecutive days. We can even access more remote locations like South Point, roughly 60 miles south of Kona. South Point is the most southern point of the United States. Its windswept coastline is rarely fished because of its distance from nearby harbors and notorious rough water. Ono and yellow-fin tuna are prime targets at South Point and the bite can be wide-open most of the time. This is a weather permitting trip.